Surprise the people you care about by sending them the offered hamper exclusively designed by Ferns N Petals to convey your message of love to your loved ones. 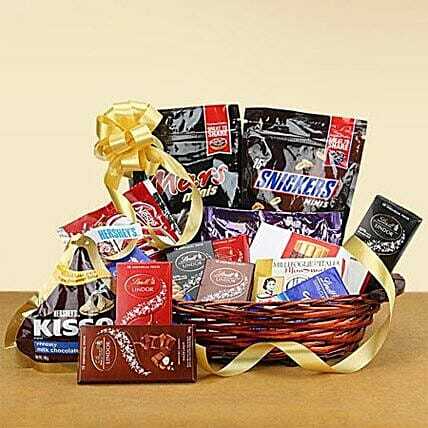 This hamper will deliver them a Wooden Basket 17x13 inches, Mars minis (15 pcs.) 270gms, Snickers minis (15 pcs.) 225 gms., Hersheys Kisses Creamy Milk Chocolate 146gms, Matilde Vicenzi Millefoglie Mini Snack Puff pastry rolls filled with hazelnut cream 75gms, Storck Merci 7 varieties of chocolate 250gms, 2 Lindt Lindor Swiss Extra Dark Chocolate 100gms, 2 Lindt Lindor Swiss Milk Chocolate with Hazelnut-pieces 100gms, 2 Lindt Lindor Swiss Milk Chocolate 100gms, 2 Lindt Swiss Classic Swiss Milk Chocolate with gently roasted almonds 100gms, Cadbury Dairy Milk (18 pcs. )234gms, Kitkat Mini (19 pcs. )250gms, Yellow Ribbon to add-on to the beauty. We will be able to attempt delivery of your order only once.The delivery cannot be redirected to any other address.